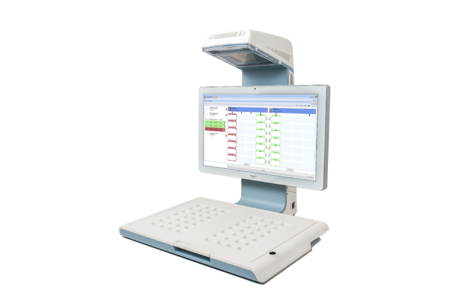 Earlier this month, RxSafe announced a partnership with McKesson Canada to bring blister card-filling automation to the US retail pharmacy market. Designed by McKesson Canada, the BlistAssist™ system is an innovative software-driven solution that improves the manual preparation and verification of single- or multi-med blister cards. If you have any experience with blister card (aka ‘bingo card’) adherence packaging, you know how tedious and time consuming the filling and verification process can be. BlistAssist’s light-guided panel and innovative software can dramatically speed up this process. Barcode verification and the unique pill-by-pill, image-driven workflow greatly enhances accuracy and verification, reducing potential for errors. The system also monitors the card filling process, allowing scheduled stops and restarts seamlessly. The solution also features the unique ability to track lot numbers and expiration dates in manually-prepared blister cards. Operator activity is tracked via a login and password, providing superior traceability for pharmacies. BlistAssist is a proven solution to help address medication adherence. Medication non-adherence leads to 125,000 preventable deaths and over $300 billion in avoidable healthcare costs each year, according to the Journal of Managed Care Pharmacy. The societal costs of medication non-adherence, from patient safety to negative health outcomes to lost productivity, are staggering. BlistAssist is a game changer for any pharmacy using blister card adherence programs, allowing them to better serve patients with chronic health needs and/or multiple medications. First, BlistAssist automatically receives your existing patient profiles from the pharmacy management software system. The patient queue is then optimized to reduce bottle handling. During preparation, a list of medications is displayed. Bottles are verified using the barcode scanner, ensuring the right medication and strength are used every time. BlistAssist’s unique projection system guides the technician so that every pill goes in the correct cup. Simple color codes indicate dosage information and help to identify quantities. This unique method makes your fastest employees even more efficient, and helps inexperienced team members get up to speed quickly. Watch the video below to learn more about how BlistAssist can improve every aspect of your card filling operation. In addition to helping pharmacy technicians fill blister cards more quickly and accurately, BlistAssist is also a huge time-saver for pharmacists performing verification. The system incorporates a unique, patented “layer-by-layer” verification process, which simplifies and accelerates verification. Pharmacists have the flexibility to conduct final verification remotely from their computer or mobile device. BlistAssist also takes up very little space, easily fitting on top of a small table or desk, and is compatible with most commonly used blister cards. For more information, visit our product page, view frequently asked questions, or speak with an RxSafe automation expert today at 877-797-2332.